Jacob Waltz was born in the kingdom of Wurttemberg Germany circa 1810. He immigrated to the USA in 1839 and became a naturalized citizen in 1864. Waltz was prospecting in Arizona and is reputed to have found a gold deposit near the superstition mountain now known as the legendary lost Dutchman Mine. 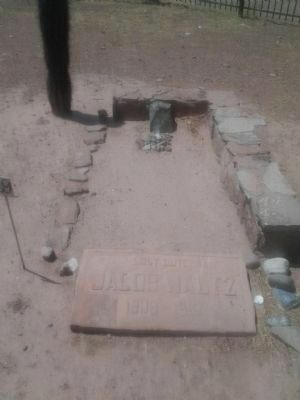 In 1868 Jacob Waltz was living as a humble farmer on the north bank of the Salt River. He died on October 26, 1891 and was buried in the southwest corner of City Cemetery. Erected 1993 by E Clampus Vitus and Dons of Arizona. Location. 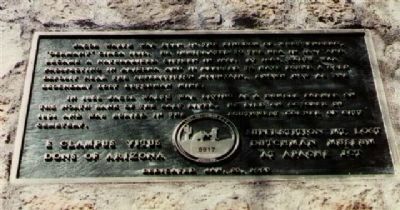 33° 26.812′ N, 112° 5.475′ W. Marker is in Phoenix, Arizona, in Maricopa County. Marker is at the intersection of 13th Avenue and West Jefferson, on the right when traveling north on 13th Avenue. Touch for map. Marker is in this post office area: Phoenix AZ 85007, United States of America. Touch for directions. (about 600 feet away); Boras Headframe (about 600 feet away); Arizona's U.S.S. Arizona Memorial - In Memory of the Gallant Men (about 700 feet away); Arizona World War II Memorial (approx. 0.2 miles away); U.S.S. Arizona Signal Mast (approx. 0.2 miles away); The Arizona Korean War Veterans Memorial (approx. 0.2 miles away); Father Albert Braun O.F.M. (approx. 0.2 miles away). Touch for a list and map of all markers in Phoenix. More. Search the internet for Jacob Waltz. Credits. This page was last revised on June 16, 2016. This page originally submitted on June 14, 2014, by Keith B. Dodds of Maricopa, Az.. This page has been viewed 512 times since then and 11 times this year. Photos: 1, 2. submitted on June 14, 2014, by Keith B. Dodds of Maricopa, Az.. • Syd Whittle was the editor who published this page. Editor’s want-list for this marker. Clear readable photo of the marker. • Wide area view of the marker and its surroundings. • Can you help?